Oh, the dabeli sandwich. I should say ‘get into da belly’. 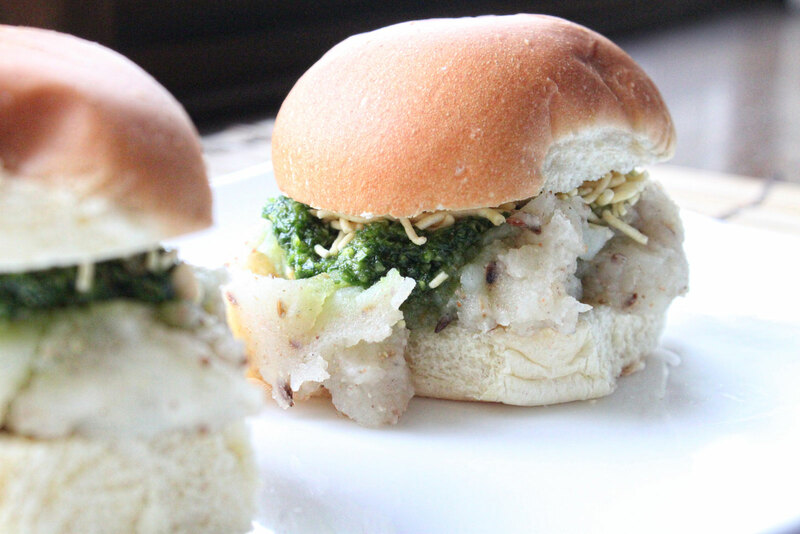 I’m sure, and maybe not, that many of you have not heard of a dabeli, but it is this funky Indian sandwich, think of it as a slider, that it’s main ingredient is mashed potatoes. Yep, a mashed potato sandwich. This thing is so crazy, but it is one of India’s popular street and snack foods. This sandwich is really unique, due to the fact that texturally it is a bit off-putting but thankfully you get some added texture from the crushed peanuts, and sev. Dabeli and Sev. Two new words for you in this culinary world. I made this sandwich only to use up leftover potato I had from making those poutine potato skins, so if you are looking for an interesting sandwich that is packed full of flavor and spices, give this one a try. Did I mention that cilantro chutney? Heat a small skillet on medium heat. Add all of the spice mix ingredients, and gently stir, cooking for only about 3 minutes, if that. As soon as you start to get all of those aromas, it is time to turn the heat off and go to the next step. Add the spice mixture to a spice grinder and pulse into you have a nice powder mixture. Set to the side. This mixture will be added when we finish cooking the already cooked and mashed potatoes. Next, wipe out the skillet. Return to a medium heat, and add in the canola oil. Toss in the cumin seeds, and let them fry for about thirty seconds, then toss in the mashed potatoes. Give this a good stir, then add in the spice mix, and give that a good stir. Cook this mixture for a couple of minutes, then add in the sugar, salt, and water. Continue to stir until the potato mixture forms into a nice, thick paste and all of the water has evaporated into the potato mixture. During this time, heat a larger skillet on medium to high heat, and add the buns to lightly toast them. Remember, this one it all about the texture. You do not want soft, on soft, or at least in my opinion you do not. OK, let’s build the sandwich. Take the bottom lightly toasted bun, and and half of the potato mixture. Top with half of the peanuts, half of the cilantro chutney, and then the sev. Where has sev been my whole life (or this sandwich for that matter)? Top with the other bun, and then repeat and build your second dabeli. Dig in. Now I admitted that this is a funky sandwich. Texturally it’s bizarre, but bizarre in such a way that those Indian spices just blow you away. It’s a punch, not only with the cilantro chutney with it’s brightness, but those spices… Whoa. I can see why this is one of India’s favorite snack. Don’t even get me started on so many of the other awesome Indian dishes out there (well, maybe you should), but I’m sure those are coming down the road anyway. Anyway, let me know your thoughts on this one. Like, or no like.